With a rich history dating back to before 6500 BC, the Isle of Man has heaps of activities to learn about its past. Originally built for a Norse king in around 1200AD, Castle Rushen was developed by successive rulers until the 1600s. Inside the Castle you’ll be able to indulge in its history and hear from some of its inhabitants, including Bishop Wilson who you will find in his cell and the castle guards in their vaulted rooms. Nestled on the promenade of Douglas stands the Gaiety Theatre, the jewel in the Manx Heritage crown. Steeped in history and tradition, the Gaiety Theatre is one of the finest remaining examples of work by the legendary theatre architect, Frank Matcham. Daily tours are available as are tickets to all productions. Built by the Gibbs, a wealthy merchant family from Liverpool as their summer retreat, it later it became their permanent family home. The Gibb sisters, Alice and Janet continued to live in the house until their deaths in the 1970’s. 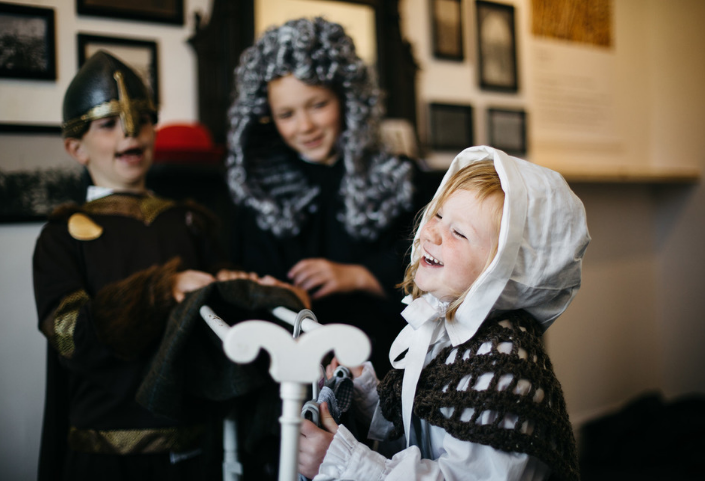 The house provides a real insight into the lives of this family from Victorian times to the 20th Century. This space serves as an arena in which Manx artists, of all genres, can showcase their talents. Being a working woollen mill, the gallery shows and promotes many of the traditional arts and crafts being revitalised on the Island. Set in 92 acres of countryside just outside Douglas, the Home of Rest for Old Horses is a tranquil sanctuary for elderly horses, including retired trammers from the Douglas Horse Trams, as well as ponies and donkeys. You can buy feed for 25p-£1 and spend some time meeting these special creatures. At the House of Manannan, journey through a reconstruction of a Celtic roundhouse, join the crew of the Odin’s Raven Viking longship and find out what life was like in a Viking longhouse. Registered Blue Badge Guide, Chris Callow offers bespoke tours of the Isle of Man, specialising in the Island's rich industrial archaeology. Explore the amazing stories behind a collection of over 400 unique exhibits from around the world, including classic cars & motor vehicles and rarely seen private motorcycles. The Leece Museum is devoted to objects, photographs and documents specifically relating to Peel in the Isle of Man. The Manx Museum is bursting with artefacts and treasures unique to the Isle of Man. The Island’s 10,000 year history is presented through film, galleries and interactive displays. Peel Castle was originally a place of worship before becoming the fort of Magnus Barefoot, 11th century Viking King of Mann. Visit St Patrick’s Church and the Round Tower which date back to the 10th and 11th centuries and step underground into the atmospheric crypt of the 13th century Cathedral of St German. Rushen Abbey was gifted by King Olaf I for use as a monastery in 1134. The centre tells its story from its religious beginnings to its more recent history of strawberry tea dancing and disco. The Villa Marina features an intimate concert hall, versatile event spaces, cinema and a children’s play area, it's the ultimate entertainment experience. The centrepiece of the Villa Marina is the Royal Hall. Hosting some of the biggest names in music and comedy, it promises a great night every time you visit.